Catrina Dickinson is haunted by her past and feels caged in by life in small town Missouri. When she discovers a strange man in Stone Field where her family grows their sorghum crop, her life takes on new meaning. He has no memory of who he is or what brought him to Cat's farm, but they fall passionately in love. Meanwhile, the country is on the brink of the Civil War, and the conflict in Missouri demands that everyone take a side before the bloodbath reaches their doorstep. A passionate and atmospheric reimagining of Emily Bronte's Wuthering Heights, Stone Field explores how violence and vengeance perverts the human spirit, and how hatred can be transcended by love. Inspired by Emily Bronte’s Wuthering Heights, Stone Field is a passionate and atmospheric story of how violence and vengeance pervert the human spirit, and how hatred can be transcended by love. Inspired by the raw wildness of Wuthering Heights, this tragic romance between a frustrated young Missouri woman and a Creek Indian in Civil War—era Missouri is a natural for readers who enjoy their historical fiction dark and sorrowful. Catrina is an entirely maddening girl: she dresses and speaks improperly. When she meets a mysterious man (whom she calls Stonefield) near her home, she is immediately drawn into a relationship that can never have a happy ending. So... a Creek Indian guy. If I get the book and read it, or if Jean gets and reads it, we'll be back with a review. He’s dark—part African-American or Creek, perhaps—and speaks in quotations from Shakespeare and Walt Whitman. [...] Like all narrators, Cat [Catrina] directs readers to what she cares about. Complex Muscogee Creek history, slavery, life in war-torn Missouri, her father’s health, and her brother’s safety are so much narrative scenery. This from Jean: It will be interesting to see how the Muscogee history is sourced, and what is included. 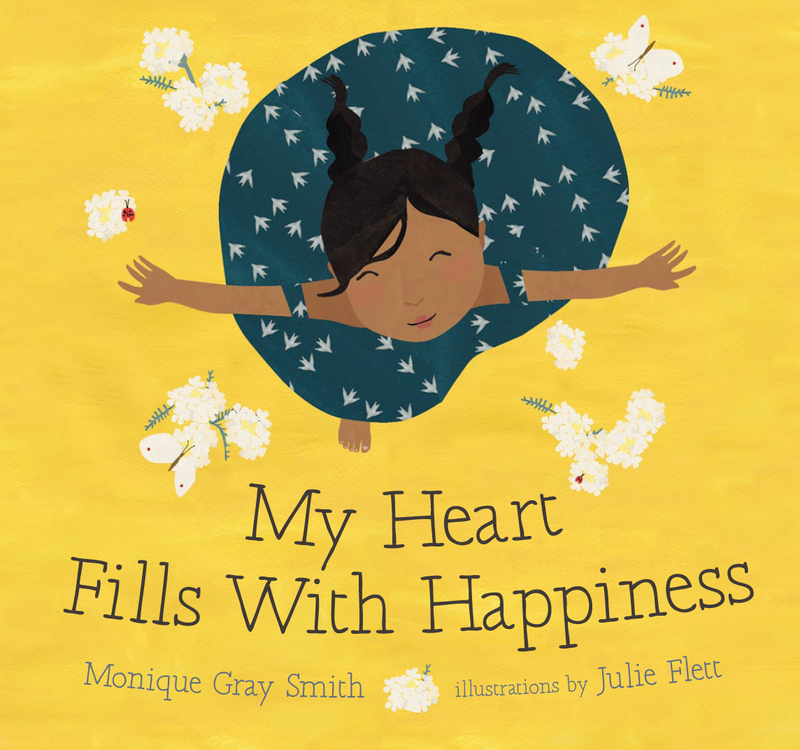 I've read My Heart Fills With Happiness by Monique Gray Smith, illustrated by Julie Flett, many times. I can't decide--and don't need to, really--which page is my favorite! For now--for this moment--I just got off the phone with my daughter, Liz. She's not a little girl anymore. She's an adult, making plans for the the coming months as she finishes law school. She makes me so darn happy! When she was little, she liked "spinny skirts." We made several so she'd always have a clean one to wear to school. So, the cover of My Heart Fills With Happiness reminds me of those days with Liz, as she spun about in her spinny skirts. Like I said, though, I just got off the phone with her, and as I think of her walking about in the many places she's going to be in May and June and July, I'm reminded of holding her hand as the two of us walked here, and there, oh those years ago! That memory, and this page, are so dear! I love the page that shows a little girl dancing, her shawl gorgeously depicted as she moves. I love the page where the little boy holds a drumstick in his hand and sits at the drum. I love the page of the kids waiting for their bannock to be ready to eat. I'd love to meet the two Native women who created this book so I could thank them, in person. My Heart Fills With Happiness got a starred review from Publisher's Weekly and another one from School Library Journal. From me, it gets all the stars in the night sky. Today is its birthday (to use the language I see on twitter). Get a copy, or two, from your favorite independent store. Last year, Scholastic, working with WNDB, put together a flyer of books specific to diversity. In theory, terrific marketing! BUT. When I saw the first page of the flyer, I wasn't happy at all to see Stone Fox on it. That book has stereotyping of Native peoples in it, and as such, is the opposite of what kids need if they're to 1) see mirrors of who they are, or 2) see accurate depictions of those who are unlike themselves. With that book on there, Scholastic and WNDB are marketing a problematic book. Stone Fox is in the 10 BOOKS FOR $10 box on bottom right of the flyer shown here. 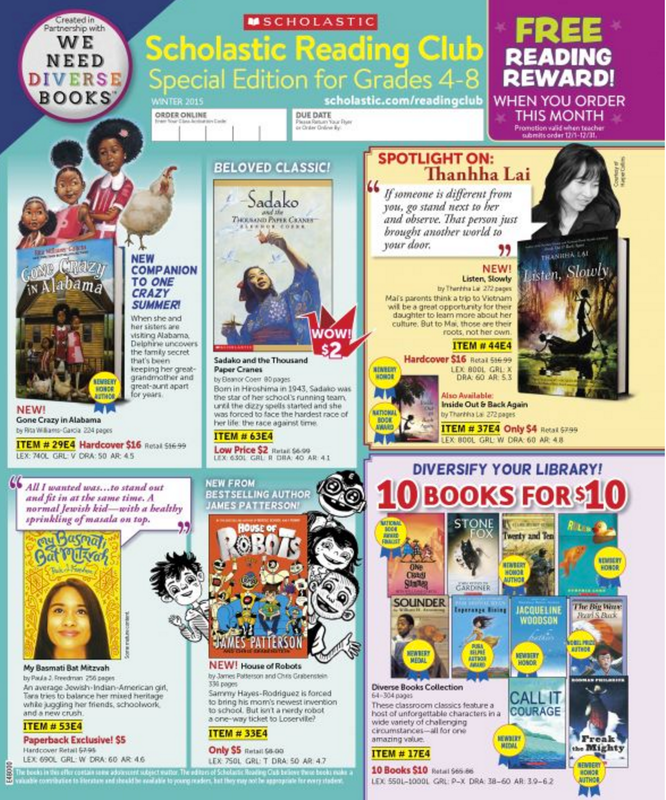 Late yesterday, Scholastic announced an expansion of its partnership with We Need Diverse Books. They're going to do eight flyers this year. Will these flyers have Stone Fox? Will they have books by Native writers? When I looked inside last year's flyer, I saw two books by Joseph Bruchac, but that's not enough. Acquire more books by Native writers and put those books in the flyers, all year long, not just in the special flyers about diversity. And on the teacher webpages. And in book fairs. Maximize the distribution, here and around the globe, too. Last night I learned a little about the flyers you publish around the globe. You're exporting stereotypes. That has to stop. Seek out books by Native writers--books published by other publishers--and get them into the flyers. Do it now. Today. I understand there's "rights" issues associated with all this but also think that your billion+ revenue could be leveraged somehow to make this happen. Get them in the diversity flyers but in all flyers. Like I said above: all year round. Every grade level. Every month. Remove books that misrepresent Native peoples from all flyers and from their website, too. There's absolutely no reason to continue to market Island of the Blue Dolphins. Or Hiawatha (the one by Susan Jeffers). Or Touching Spirit Bear. Or Sign of the Beaver. Or The Girl Who Loved Wild Horses. Or Julie of the Wolves. Or Indian in the Cupboard. Those are some of the books you distribute. STOP. And I know there are others, too. Take some of that billion dollar revenue and hire people with expertise---not just in kidlit---but in Native Studies, to help you with all these tasks. I'm not asking you to hire me. But I think I can help you find people who would work with you. All this money you're making, right here on what used to be Native lands... come on. Step Up. Ebony Elizabeth Thomas has been doing some writing about distinctions between marketing, advocacy, and activism that I find helpful as we all live through these periods of fighting for change in what we get from the publishing industry. The Scholastic flyers are marketing. I think it is marketing borne from activism, but as I noted above, there's a lot more to do with what Scholastic publishes, and what they choose to market. Some people think I hate Scholastic. Some people think I hate white people. Neither is true. Last night I did a series of tweets about how much I love Shadowshaper and If I Ever Get Out of Here. I wanna see several of the people who made those two books possible, working in-house at Scholastic, getting us more books like that. I'll be waiting to see the new flyers. Not just the diversity ones. Every single one. They are a way to measure what Scholastic is doing. Doing content analyses of the flyers provide us with a way to test what Scholastic is doing. The flyers, as I view them, are a test that--if passed--could win back the trust they've lost. When you live in the Arctic in winter, everything is a shade of white. A young girl looks around her home in the Arctic and sees only white, white, white...but one day her grandfather takes her on a journey through the tundra. And at the end of their cold walk across the ice, they find something special that brings color into their world. A modern paint box, a bound book, and a flashlight, together with the second-person, present-tense address (placing readers inside the story), imply a contemporary setting, but this girl lives a nonindustrialized life in an iglu, even though most contemporary indigenous Arctic people live in houses. The lack of any specific indigenous nation and some faux Native philosophy—“Grandfather says hope is golden. You can only see it when you look into a snowy owl’s eyes”—add to the romanticized Native image. Jan Bourdeau Waboose’s SkySisters (2000), an Ojibwe story about walking across tundra to see the northern lights, is a better choice. I absolutely love SkySisters and am thrilled to see Kirkus sending readers to it instead! If I get a copy of Arctic White and read it, I'll be back with a review. For now, I think I'd agree with the Kirkus review. Debbie--have you seen... TRU & NELLE by G. Neri? Long before they became famous writers, Truman Capote (In Cold Blood) and Harper Lee (To Kill a Mockingbird) were childhood friends in Monroeville, Alabama. This fictionalized account of their time together opens at the beginning of the Great Depression, when Tru is seven and Nelle is six. They love playing pirates, but they like playing Sherlock and Watson-style detectives even more. It’s their pursuit of a case of drugstore theft that lands the daring duo in real trouble. Humor and heartache intermingle in this lively look at two budding writers in the 1930s South. With Harper Lee's death and the publication last year of Go Set A Watchman, this book is timely and could do quite well. My quick look inside in the "look inside" feature at Amazon tells me there's a character in it named Indian Joe. If I get it, and read it, I'll be back. If you got it, and read it, let me know!